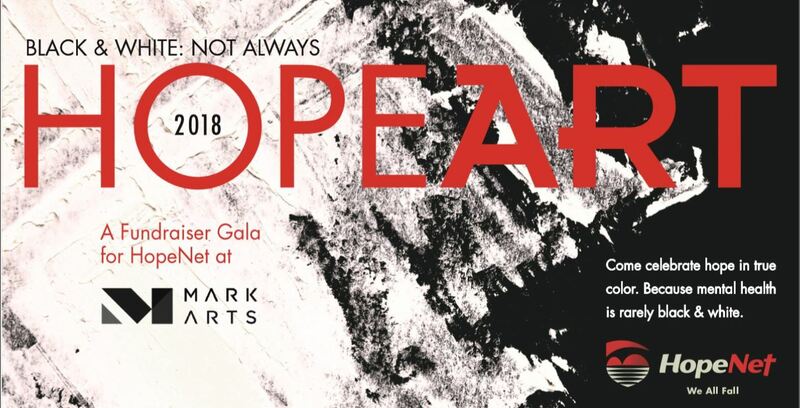 HOPEART 2018, our gala fundraiser, will be held at Mark Arts on September 23, 2018. Donations raised from this event provide coaching, counseling and Christian care for those who otherwise cannot afford it. HopeArt guests will experience masterpieces in the making through a variety of artistic experiences and through the stories of HopeNet clients. Because mental health is rarely black & white. Mental health is complex and personal. This is a fundraiser to raise funds for those who otherwise cannot afford to receive help at a critical time of need. Mental health has a ripple effect on family and community. Can’t Come? We still need you. Here’s how you can get involved. Not able to attend? Help us reach even more clients in 2018 and into 2019 by supporting a client. It takes $600 to serve a client for a year. Please consider giving $300, $600 or even $1200 to support the clients of HopeNet. Questions? Call Jessica Boone, HopeNet Event Coordinator at 316.684.4673 for more information.